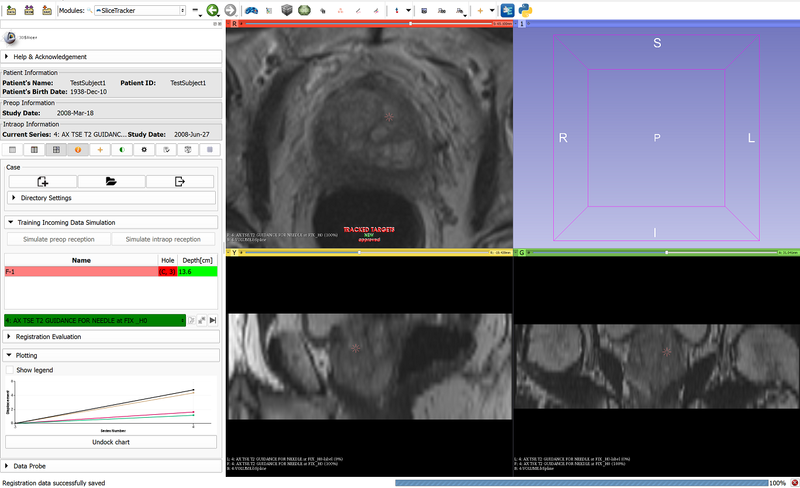 SliceTracker is a 3D Slicer extension designed to support the workflow of the in-bore MRI-guided targeted prostate biopsy (MRgBx) (see references below for clinical context). SliceTracker was developed and tested to support transperineal MRgBx procedure in the Advanced Multimodality Image Guided Operating (AMIGO) at the Brigham and Women&apos;s Hospital, Boston. Its applicability to other types of procedures has not been evaluated. visualization of the intra-procedural images and support of specialized hanging protocols to facilitate needle tracking, biopsy template and calibration device visualization, assessment of the image registration results, etc. For more details, please read SliceTracker user guide. SlicerTracker, same as 3D Slicer, is a research software. SliceTracker is NOT an FDA-approved medical device. It is not intended for clinical use. The user assumes full responsibility to comply with the appropriate regulations. The following publications cover different aspects of work that led to the development of SliceTracker. Behringer P., Herz C., Penzkofer T., Tuncali K., Tempany C., Fedorov A. 2015. Open-­source Platform for Prostate Motion Tracking during in­-bore Targeted MRI­-guided Biopsy. In: MICCAI Workshop on Clinical Image-based Procedures: Translational Research in Medical Imaging. DOI: 10.1007/978-3-319-31808-0_15 (also see the accompanying web site): software development, prostate motion tracking. Fedorov A., Beichel R., Kalpathy-Cramer J., Finet J., Fillion-Robin J-CC., Pujol S., Bauer C., Jennings D., Fennessy F., Sonka M., Buatti J., Aylward S., Miller J V., Pieper S., Kikinis R. 2012. 3D Slicer as an image computing platform for the Quantitative Imaging Network. Magnetic resonance imaging 30:1323–1341. DOI: 10.1016/j.mri.2012.05.001: 3D Slicer platform. Fedorov A., Tuncali K., Fennessy FM., Tokuda J., Hata N., Wells WM., Kikinis R., Tempany CM. 2012. Image registration for targeted MRI-guided transperineal prostate biopsy. Journal of magnetic resonance imaging: JMRI 36:987–992. DOI: 10.1002/jmri.23688: deformable registration approach. Penzkofer T., Tuncali K., Fedorov A., Song S-E., Tokuda J., Fennessy FM., Vangel MG., Kibel AS., Mulkern RV., Wells WM., Hata N., Tempany CMC. 2015. Transperineal in-bore 3-T MR imaging-guided prostate biopsy: a prospective clinical observational study. Radiology 274:170–180. DOI: 10.1148/radiol.14140221: clinical results. Tokuda J., Tuncali K., Iordachita I., Song S-EE., Fedorov A., Oguro S., Lasso A., Fennessy FM., Tempany CM., Hata N. 2012. In-bore setup and software for 3T MRI-guided transperineal prostate biopsy. Physics in medicine and biology 57:5823–5840. DOI: 10.1088/0031-9155/57/18/5823: procedure technical setup.